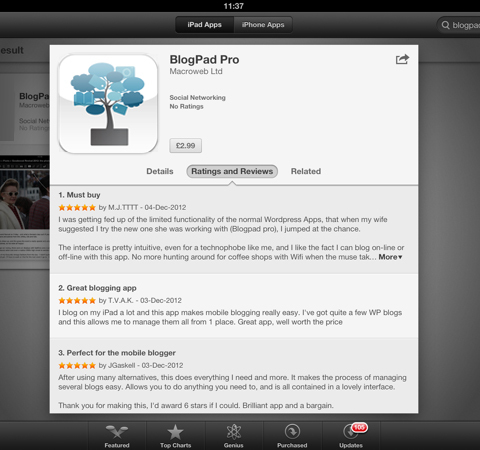 Wow, one week after launching BlogPad Pro for iPad we’ve had some great ★★★★★ ratings and reviews in the App Store, thanks everyone! I often write blogs on the train & the amount of times I have lost work due to not be able to work offline on a WordPress app. This app solves the problem, especially when it’s so easy to update my live blogs when I get back online again! (and this one’s my favourite) Thank you for making this, I’d award 6 stars if I could. Brilliant app and a bargain. Also, if you’ve tried our app and have any feedback about features you would like to see, or any problems you’ve had please get in touch and we’ll try and help! This entry was posted in News & Press Releases and tagged app, app store, apple, blog, blogging, iPad, ratings, reviews, technology, wordpress.